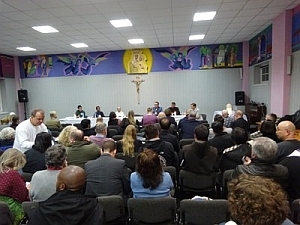 Faith-based groups gathered on 2 December, the eve of the opening of the United Nations climate conference, in Katowice, Poland, for an Interfaith Talanoa Dialogue to take stock of the collective global efforts to reduce the emissions of greenhouse gases. Racist, anti-Semitic, and xenophobic views have no place in a society that cherishes freedom and liberty for all. 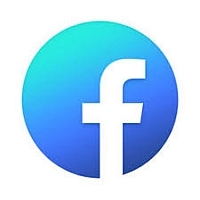 The right to speak and to hold repugnant views is not a right to circumscribe the ability of others to live in peace and security.” – Rabbi Rick Jacobs, Co-President of Religions for Peace. Responding to the violence in Charlottesville, Rabbi Rick Jacobs has turned to all people of goodwill to delegitimize racial hatred and reaffirm civil unity in the United States. 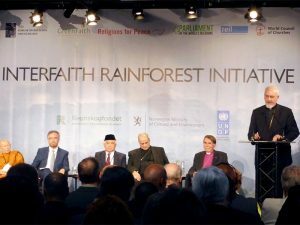 The Interfaith Rainforest Initiative announces that today, there is an urgent need for religious communities to work together to protect the world’s rainforests and the indigenous peoples who take care of them. 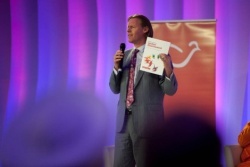 In response to the largest humanitarian crisis since the Second World War and one of the great ethical challenges of the 21st century, the third meeting of Ethics in Action addressed mass migration, emphasizing the underlying ethical principles that all communities affected by the refugee crisis share. 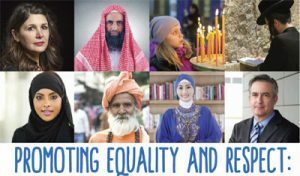 Religions for Peace will be partnering with many organisations worldwide on World Day of Peace, 2016. As we know, achieving a more peaceful world is a shared responsibility and it is only through our collective efforts, actions large and small, that we will persevere in creating a safer, more just world for all people. 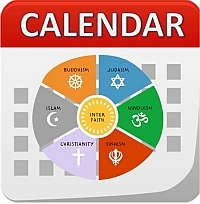 On the occasion of Eid-al-Fitr (the conclusion of the month of Ramadan) Religions for Peace stands in soldarity will all practitioners of Islam and with all – in every faith and in every region on Earth – who seek tolerance, respect, understanding and harmony among the peoples of Earth. Secretary General William Vendley gives a message of solidarity. 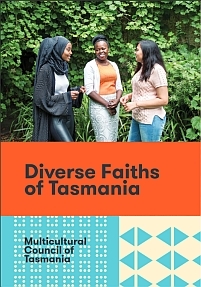 Although our planned gathering for March, to support the official opening of the UTAS Multifaith Centre and planting of a Peace Pole at UTAS has been postponed till later in the year. 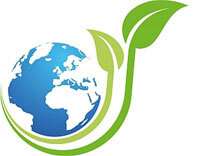 In the meantime, there are many events happening this month, which you may like to know about. 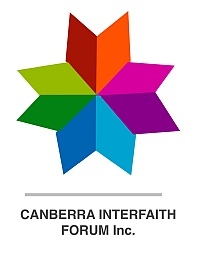 The event intended for March, Religions for Peace (Tas) participation in the official opening of the UTAS Multifaith Centre and the planting of a Peace Pole nearby, has been postponed till later in the year, so there won’t be an event for March. Global religious leaders committed today to work together to resist hostility toward the “other” in their declaration: “Welcoming the Other – A Multi-Religious Vision of Peace.” The declaration, adopted on the last day of the Assembly, presents a framework for action going forward. 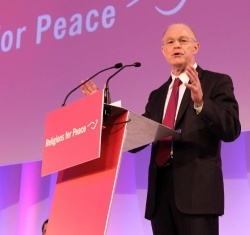 Religions for Peace, at its annual assembly in Vienna 20-22 Nov 2013, declared the use of nuclear weapons and other weapons of mass destruction as immoral and launched a Nuclear Disarmament Resource Guide for Religious Leaders and Communities. 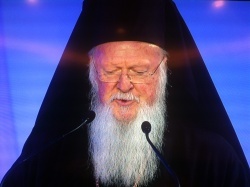 Ecumenical Patriach of Constantinople, Patriarch Bartholomew I addessed the Ninth World Assembly of Religions for Peace on Mobilizing Action for Human Dignity, Citizenship and Shared Well-Being. At the 9th World Assembly of Religions for Peace, Muslim and Christian Leaders Call for Common Action. 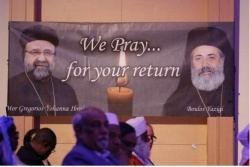 Syrian religious leaders attending the 9th World Assembly of Religions for Peace called for the release of two abducted bishops in Syria. 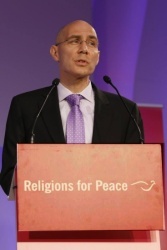 UN High Commissioner for Refugees was represented by Volker Türk, UN Director of International Protection, who gave an address on the institution of asylum is founded upon fundamental human values. 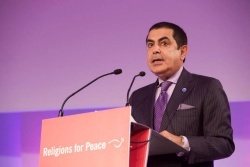 High Representative of the Alliance of Civilizations, Nassir Abdulaziz Al-Nasser, addressed the Ninth World Assembly of Religions for Peace. Representative Nasser told that Religions for Peace and the Alliance of Civilisations have a common objective in serving the world by promoting peace, stability and harmony. 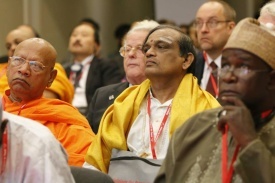 On November 20th, the 9th World Assembly of Religions for Peace convened in Vienna, Austria. Here we bring you video from the Opening Day Press Conference. 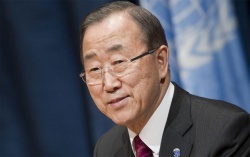 UN Secretary-General Ban Ki-moon’s sent one message, delivered by Nassir Abdulaziz Al-Nasser, United Nations High Representative for the Alliance of Civilizations, to the Religions for Peace Ninth World Assembly. 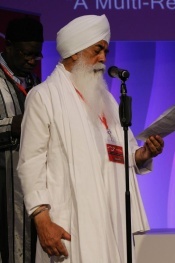 The 9th World Assembly of Religions for Peace began on November 19, bringing together more than 600 religious leaders representing Baha’i, Buddhist, Christian, Hindu, Indigenous, Jain, Jewish, Muslim, Sikh, Shinto, and Zoroastrian communities.